Is it your HOME or the SCHOOL that has the biggest impact on our child’s eating and exercise patterns? Is it your home or is it the school that makes the biggest difference in teaching your child about healthy eating and exercise? Which venue makes more of an impact on the health of your children? You might be thinking, “My son’s day care doesn’t serve the most nutritious meals, so are they ruining his health?” Or maybe you are packing your kids lovely nutritious meals at school, but when they get home, they’re allowed to help themselves to the junk food in the cupboard? Is it our HOME or the SCHOOL that has the biggest impact on our child’s eating and exercise behaviours? By ‘behaviours’ we aren’t talking about being naughty. Behaviours refers to their eating and exercise patterns. How much nutritious food they eat, and how much exercise they do. Joyce will share the results of her study, and what that means for you as a parent in this short article. 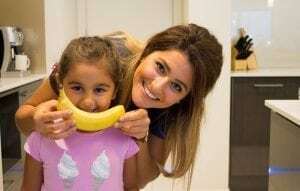 It is well established that children’s eating and exercise habits are influenced by the home and by the school environment As an example, if parents eat fruit and vegetables at home, the child will also eat fruit and vegetables. If the school restricts selling ‘junk food’, the child won’t eat as much ‘junk food’. Which one has more influence? School, or home? Children in Grades 4 – 6 (mostly 9-11 year olds), their parents, and their school principals were studied. Interestingly, we found that the home environment is in fact a stronger influence on children’s eating AND physical activity AND weight, compared to the school environment. When I say ‘the home environment’, I mean how parents role modelled healthy eating and physical activity. So, the more positively the parents were role modelling, the healthier children were eating, and the more physical activity they did. I’ll give some tips on how you can be a positive role model shortly. Although this group of children spend a lot of time at school, most of their day is actually spent at home. This means that parents at home still have a very big influence on children of that age, even if parents think they’re not spending much time with them. It is important for parents to be positive role models if they want children to do more activity and eat more fruit and vegetables. KNOW that your children need more than 60 minutes of physical activity every day. This way, you can start ENCOURAGING them to do some running around. Summer school holidays are coming up – the perfect time to start getting active. Make use of any chance you can get: grab your children and go outside!! If the children want to go to their friend’s house nearby, take some time to walk them there. If it’s a hot day, go to the beach or go to a swimming centre. Now let’s be honest, if parents aren’t eating enough fruit and vegetables, then the child is very likely to do the same thing. So it’s important that children see YOU eating your fruit and vegetables! As a guideline (not a rule), the recommended minimum amount is 2 serve of fruit, and 5 serves of vegetables. This recommendation is a little less for the little ones. Check out how many serves children need here. The more fresh food is available at home, the easier it will be to meet the recommendations. Fill your fridge up with fresh fruit and veg: If it’s there, it’s going to get eaten! But here’s the catch – don’t stuff an uncut watermelon or a whole bunch of celery in the fridge because no-one is going to be bothered cutting it. So, as soon as you get home from the grocery store, cut up all your fruit and your veg. Cut up watermelon into fun shapes (triangles are fun enough I think) – and store them in a big container. Everyone loves cold watermelon on a hot day! Always, always, always have a fruit bowl on the kitchen bench – when you’re hungry, it’ll be the first thing you see, therefore the first thing you reach for. These are just a few tips for you, as a parent, which can really make a difference on children’s eating and exercise. And remember, it is never too late to be a positive role model!! Disclosure: These results have not yet been published, but have been submitted to a well-known journal. It is also important to note that there may be other aspects of the home and school environments not included in our study. 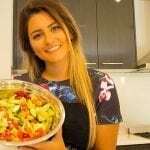 Author: Joyce Haddad, Director of A Dietitian’s Mission, is an Adelaide based Dietitian/Nutritionist and Master Personal Trainer with a passion for health and wellbeing. ADM aims to help the public make informed and realistic nutritional choices and ensure everyone has a healthy relationship with their body and with food. Lemon in Water – Can it Detox You?